The dinner menu (to distinguish it from the breakfast or lunch menus) is very short. Only four things for a main course – Piri Piri chicken, Soy Glazed Ribs, Tiger Prawn platter and Courgette fritters. All come with fries (delicious chunks of fried potato served with tomato ketchup) and some come with a small salad and the Prima Donna salsa. We of course had to start off with some olives, which get a thumbs up from us, making a change from many of the local restaurants. 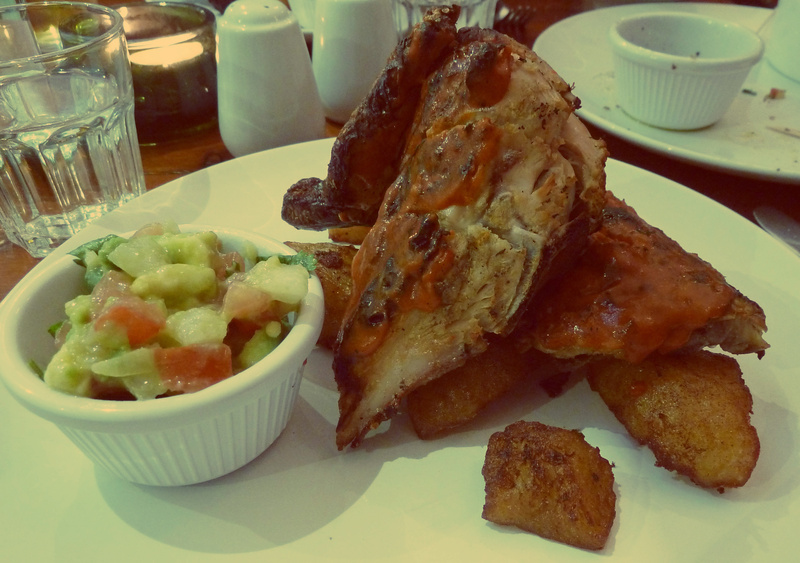 We chose piri piri chicken with individually tailored level of heat and one portion the ribs. Both my dinner companions chose the half chicken – the quarter chicken was only a small amount of money less. 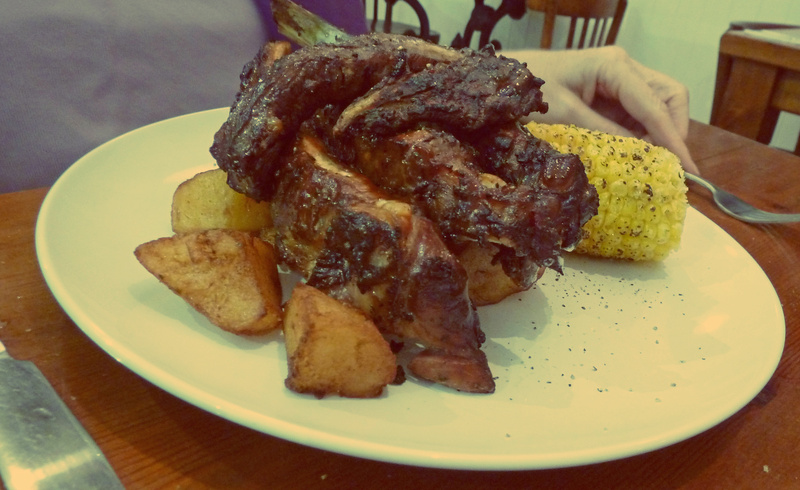 It was a bit short on sauce but was acceptable and the ribs were plentiful. My corn on the cob was a bit watery as I assume that it had been left floating in water for a little too long. There are no desserts but there is good coffee and cake (bought in from Maurillio). 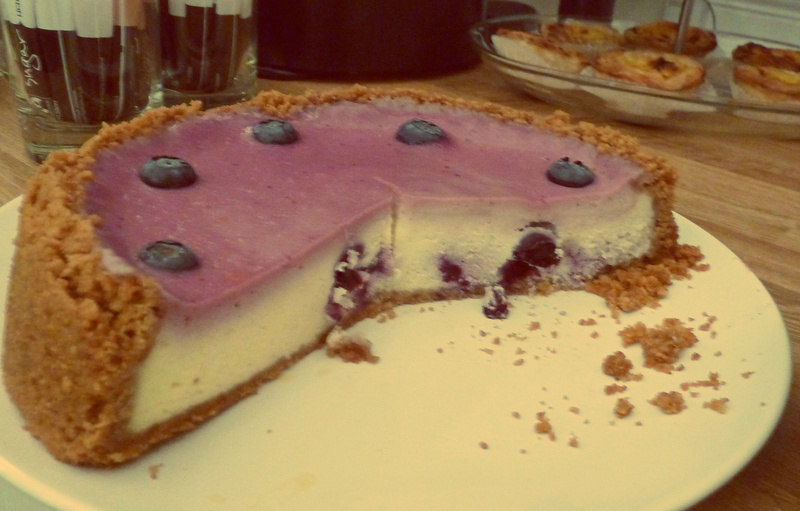 We chose the frangipan and the cheesecake. Both were a great end to our meat filled dinner. We washed the whole meal down with Sangre beer (£3.00 per pint) and tap water. The service was very attentive with lots of opportunities to ask for anything we wanted and lots of checks to make sure we were fine. Prices were also very reasonable with the total cost of £48.30 for three. It is open Monday through Sunday but only in the evening from Thursday to Saturday when it closes at 11.30 so you will now be able to eat after a visit to the Ritzy. On a side note we feel that as this place seems to concentrate on breakfast, lunch and dinner we will make sure we visit again soon for breakfast and update this review with our thoughts. My partner and I just had a delicious meal here, have read a few lukewarm reviews and think everyone must just be being very harsh! We had lovely starters and two types of ribs for main courses, both of which were cooked perfectly in yummy sauces. Wine was nice too, and it was all good value with very attentive service. We would definitely eat here again. Two starters, two mains, and two large red wines plus coffee came in at £39. I’m so confused as to why you have started such a bad blog about this restaurant. I’m a local to brockwell park and the guys that opened Prima Donna( the name was given because the young chef is a Prima Donna when he gets stressed, but you’d know this, if you’d written a better blog about Brazas restaurant.) also own Brazas restaurant. They have treated me and my family to many good meals, and I have never had a bad meal from them. 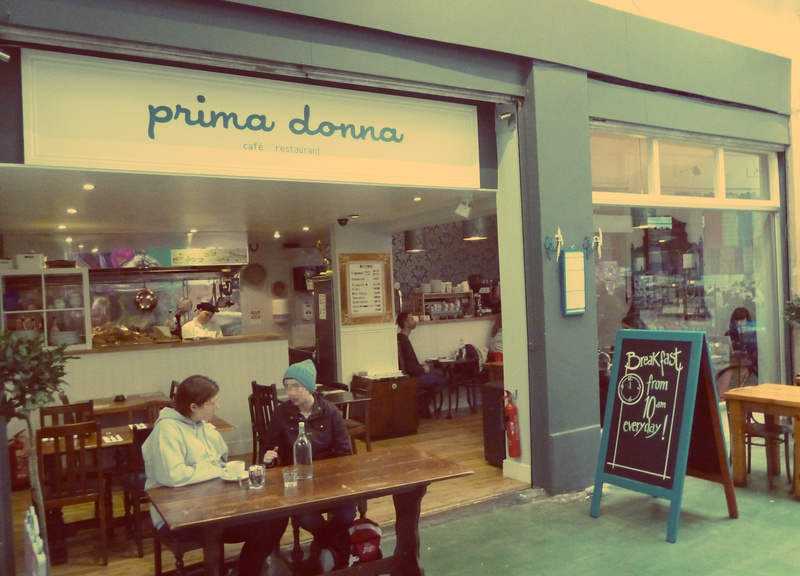 Prima Donna offers a great range of food and they also have now a great seasonal menu. The cakes are great like you say, but then again who doesn’t like cake. I urge you to go and try them again, make yourself known to them and you’ll have a good time. Go for breakfast and have the eggs prima donna – they were delicious. They were playing south american music when we were in there and I heard some portuguese so assume they’re brazilian! When I went in the other week (lunchtime on a Saturday) they were playing opera, which we assumed was the reasoning behind the name. Maybe it just got a bit too intense! I just had a coffee but defs going back to try the breakfast, yum.